The Northborough – Southborough School District is continuing its series, bringing in experts to help parents and teachers. Up first this fall is an expert on reducing students’ anxieties. The presentation for parents will be held on Monday, September 18th, 6:30 – 8:30 pm in the Algonquin auditorium, 79 Bartlett St, Northborough. an invisible disability. . .teachers can’t look at a student and know what is going on internally. additional guidance for creating and implementing successful behavior intervention plans (“FAIR Plans”) for the students teachers worry about the most: those with anxiety-related or oppositional behaviors. Since 2000 she has worked with students who struggle with mental health issues and challenging behavior in public school systems. She specializes in training staff and creating behavior intervention plans for students who demonstrate explosive and unsafe behavior. She also works with students who have emotional and behavioral disabilities, anxiety disorders, or high-functioning Autism. 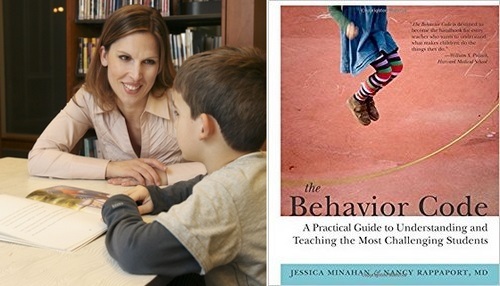 Her particular interest is to serve these students by combining behavioral interventions with a comprehensive knowledge of best practices for those with complex mental health profiles and learning needs. She’s a blogger on The Huffington Post, the author of The Behavior Code: A Practical Guide to Understanding and Teaching the Most Challenging Students, with Nancy Rappaport (Harvard Education Press, 2012), and author of The Behavior Code Companion: Strategies, Tools, and Interventions for Supporting Students with Anxiety-Related or Oppositional Behaviors (Harvard Education Press, 2014).